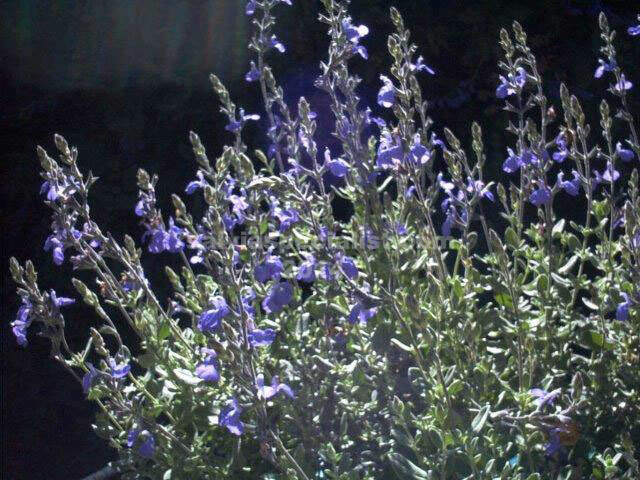 Chamaedryoides is one of the first salvias I brought to Australia in the early 1990′s and has become a classic for its accommodating behaviour. It originates in Texas and Mexico. It is a short, 30cm, grey leaved evergreen with bright blue flowers in warm weather. It is often used as a border plant and under roses and is best in sun. Frost and drought are not a problem.Chamaedryoides suckers gently to about 50cm. Being a grey plant it is not for humid tropics. It could be pruned to the ground mid summer with hedge shears. It can be propagated from division, cuttings or seed. Being grey leaved they are hard for me to propagate as too much water rots the small cuttings.